Can you imagine spending half a day in a workshop on business ethics…and coming away feeling that the experience has been “amazing,” “inspiring,” and “life-changing”? Developed by the CENTER FOR COWBOY ETHICS AND LEADERSHIP in partnership with University of Wyoming College of Business, the workshop is designed for businesspeople who want to be principled leaders in their companies, industries, and communities. It is offered in two formats so it can fit into varying meeting agendas — a 60-minute version, and a two- to three-hour version allowing for wider-ranging discussion and interaction. Uses the common-sense principles of Cowboy Ethics — not some complex set of rules — as its reference point. The anchoring idea is that true integrity can only come from within. Is thought-provoking and interactive. How can businesspeople come to grips with the ethical dilemmas they may encounter daily? Standing Tall is a shared experience that sheds light on the very real ethical issues facing businesspeople today. An outgrowth of the workshop is the Community of the Code, a network of program graduates who have each made a pledge — a pledge to themselves — that they will strive to live their codes each day, and share with each other the insights gained and lessons learned along the way. 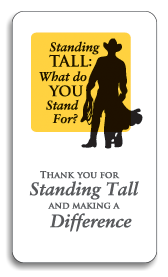 Click the play button below to view a trailer of the film that inspired the Standing Tall initiative. For more information, please contact workshop leader Kent Noble at kentnoble@cowboyethics.org or (307) 760-7860.